Today I reprised a bit of what we discussed yesterday – how Jared, seeing the fragmenting of his society’s language, implores his brother to ask the Lord that at least the two of them will retain understanding of each other. The brother of Jared does so and the Lord says yes, due to his goodness. Then Jared, thinking about their friends, requests that his brother implore the Lord that their language not be scrambled, either. The brother of Jared asks and the Lord bequeaths. Jared, ever insightful, would like to know if they are going to be scattered and asks his brother to find out. And then here is where Jared is so visionary. He suggest that his brother request that IF they are going to be scattered, why not be scattered to the most blest of all places? The Lord says yes and then tops that, saying He’ll make of Jared’s people the greatest of all civilizations. And the kicker? This is where I reminded the kids of the final question from yesterday’s “Spiritual Midterm”: Does the Lord get tired of our prayers? I reminded the students that the final sentence in Ether 1 answers that question. The Lord does NOT get tired of our petitions. In fact, we are taught TO pray. I shared with the class several of the quotes in the manual and bore testimony as to the importance of praying for help. Then I passed out popsicle sticks, some long, some short. I asked the class to think. If they had the same opportunity (which they do – thus, the purpose of this whole activity) to approach the Lord to petition for their greatest desires, what would be their requests? Jared had three requests; I wanted them to think of six (for the purpose of the activity, I needed them to come up with six to match the 2nd half of the activity). They wrote each of their requests, in pen, on one of the popsicle sticks. Then we looked at Ether 2. We noticed that the first three verses were all about “Preparation.” I had them write that word out to the side of those three verses. Then next four verses were about “obedience,” as we read that the families were obedient in gathering to the “quarter where there never had man been” (vs 5) as asked by the Lord. I asked the kids to write “Obedience” to the side of these verses. They looked and quickly saw that the Lord had vowed to sweep off any unrighteous inhabitants from the promised land. We saw this as a class during our previous study of Mormon, in the destruction of the Nephites, and I told the class we would be seeing this by the end of the Jaredites’ history. Therefore, I asked them to write “Caution” to the side of the promised-wrath verses. Then we saw how in vss. 14-15 how the Lord chastened the brother of Jared, and how beautifully Jared’s brother responded to the admonition of the Lord (as opposed, say, to the response of Laman and Lemuel). We discussed how when we repent, we then receive further light and knowledge from the Lord, just as Jared’s brother did (in the second half of vs 15). The class wrote “Repent” to the side of vss. 14-15. 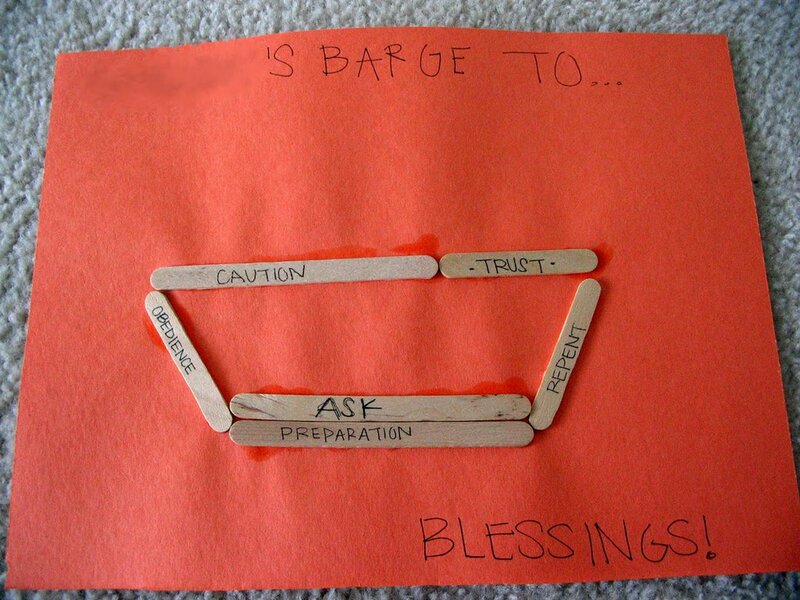 Then we noticed the Lord told Jared’s people to build the barges in a certain way, as found in vss. 16-17. We wrote “Trust” by the side of these verses, noting the trust these people had by eventually committing themselves into these barges. And finally, we wrote “Ask” by the side of vss. 18-19, where the discourse begins again with the brother of Jared petitioning the Lord regarding certain issues with the barges. I wanted the students to see that in this example, as with all examples, when the Lord gives a blessing, that is NOT all that needs to happen. Just as Lehi had received the promised land prior to ever arriving, but needed to work really hard to bring it about – so, too, did the brother of Jared receive a promise. But his people also had to go through many steps to bring it to pass. I wanted the students to think on this. That’s why our next step included writing each of the six summary words (Prepare, Obedience, Caution, Repent, Trust, Ask) on the flip side of their sticks (where they’d written their desires of the Lord). Then I suggested they were ready to build their own spiritual barges. We had initially started off class today by looking at a newspaper report of the very sad bombing in Iraq yesterday. We talked living in the last days and about how going through life will require complete trust in the Lord, and that as we build our own spiritual barges to travel to our personal promised lands, we will be found capable and eternally successful of receiving the Lord’s blessings – because of our willing obedience and hearkening ear. I bore my testimony as to the power of prayer and how much Heavenly Father loves us. He desires us to think for ourselves and to come to Him as we have needs. For after all, as we read in the scriptures, what father would give his son a snake or a stick if his son asked for a fish? But I shared that as we come to the Lord and receive promised blessings, we’re not done! The brother of Jared received affirmation as to Jared’s original petitions. But all was not done. They had seeds and animals to gather, they had barges to build, and they had a journey of effort yet to undertake to then receive those promised blessings. I promised the students that as they “prepared”, “obeyed,” were “cautious” as they went through life, “trusted”, “repented”, and “asked”, that the Lord would bring them also to their promised blessings. We closed by having them create their own personal barges of faith by arranging their petition sticks on the paper and gluing them in place. The kids could choose whether they wanted to place their petitions right-side up or the obedience-reminder sides right-side up for their barges – whichever felt the most important to remember for them. Hopefully as we went through this activity, they had the opportunity to personally apply this ancient record in a deeper way to their own life, with their own current needs. For truly the Lord is a Lord of goodness. We read in D&C 111:11 that He stands to bless us with the richest of blessings AS SOON as we are ready to receive them. All we need to do is ready ourselves, ask, and then prepare and work in many ways to receive them. By so doing, we can walk in the same footsteps that the brother of Jared did. That’s a pretty good path! For more ideas on teaching and to receive the free monthly Seminary Class Notes newsletter, simply click here to sign up! just another early-morning-seminary-teacher mom! :0)Free resources for the LDS seminary teacher.